INTRODUCTION: Research since 2007 has shown that quantum coherence is utilised in increasing the efficiency of energy transfer in photosynthetic systems. What has not been emphasised in the discussion of this research is that the mitochondria that produce energy in animals cells probably evolved from the same type of bacteria as the chloroplasts of modern plant systems. Evolution tends to retain features so the likelihood of quantum coherence being utilised in human cells including neurons looks quite high. The high levels of activity and integration associated with conscious processing looks a possible trigger for requiring a more efficient form of energy transport. Photosynthesis, by which sunlight is converted into energy for organisms was the first type of organic energy to appear. With the eukaryotic cells, such as those found in modern animals and plants, specialised membranes in energy-converting organelles perform this function. These organelles are mitochondria in animal cells, and the quite similar chloroplasts in plants. Both mitochondria and chloroplasts are characterised by a large amounts of internal membrane, and these membranes are involved in the transfer of electrons and the production of ATP. It is thought that both mitochondria and chloroplasts evolved from unicellular prokaryote cells that were subsequently engulfed by primitive eukaryote cells. Mitochondria, chloroplasts and prokaryotes use a common pathway, known as chemiosmotic coupling, to generate energy. This name refers to the connection between the generation of ATP and membrane transport. Electron transfer provides most of the energy for living things. Electrons move spontaneously between molecules with a low affinity for electrons, to molecules with a high affinity for electrons. The process of chemiosmotic coupling is performed by protein complexes embedded in membranes. A proton (H+) gradient over the membrane allows the synthesis of ATP. ATP is used as a store of energy in cells to drive chemical reactions within the cell. Its energy can be released by giving up terminal phosphate which changes it into ADP. Phosphorylation subsequently recycles the ADP back into the ATP energy store. High-energy electrons are derived from processes such as sunlight for photosynthesis, or the oxidation of food-derived molecules in animals. These high-energy electrons are transferred by means of electron carriers embedded in the membrane. Electron transfer releases energy, which pumps protons across the membrane, creating a proton gradient. This gradient represents stored energy, which drives an enzyme to synthesise ATP from ADP and phosphate. Electron transfer provides most of the energy for living things. Electrons move spontaneously between molecules with a low affinity for electrons, to molecules with a high affinity for electrons. Each carrier can interact only with the carrier adjacent to it. Electrons can move along covalent bonds. They can also jump across a gap of as much as 2 nm. This jump is achieved by quantum tunnelling. The drop in redox potential between two electron carriers is proportional to the free energy released when an electron transfers between them. The mitochondria produce most of the ATP in an animal cell. Energy is harnessed by an electron-transport chain in the mitochondria’s inner membrane. A large amount of free energy is released when protons (H+) flows back across the inner membrane to allow the production of ATP by the ATP synthase. This provides a high level of free energy to drive the whole cell’s requirements. The ATP synthase is of ancient origin. The same enzyme is found in mitochondria, chloroplasts of plants and algae and the plasma membrane of bacteria. Mitochondria convert energy from chemical fuels, while chloroplasts convert energy from sunlight. With mitochondria, electrons released from carbohydrate food molecules are transferred through the organelle’s membrane by a chain of electron carriers. They release energy moving from a high energy to a low energy state. Electrons are transferred by diffusing molecules that attract an electron at one location and shed it at another. This is known as an electron-transport chain and is associated with the inner membrane of the mitochondria. Several of the main components of the chloroplast are similar to those of the mitochondria, but the chloroplast membrane also has some components not found in the mitochondria, notably the photosystems of the chloroplast where light is captured by chlorophyll to drive the transfer of electrons. The plasma membranes of most bacteria contain an ATP synthase similar to those found in mitochondria. An electron-transport chain harvests energy by pumping H+ out of the cell, establishes a proton gradient, and thus drives the ATP synthase to produce ATP. In the chloroplasts, ATP provides fuel for organic molecules. The mechanisms involved in light-driven photosynthesis are the same in principle to those used by the membranes of mitochondria. Chloroplasts are contained within two concentric membranes. 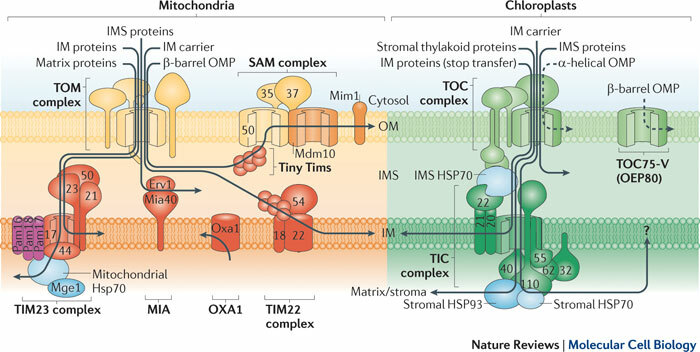 They use the same type of chemiosmotic processing as mitochondria, and although much larger than mitochondria, they are organised on the same principles, with transport proteins embedded in the less permeable inner membrane. The inner membrane encloses a space called the stroma, which is analogous to the enzyme containing matrix in mitochondria, with both spaces containing enzymes. However, the chloroplasts have a third distinctive membrane not found in mitochondria. This is the thylakoid membrane which contains light-capturing systems, electron-transport chains and the ATP synthase. The first stage of photosynthesis is that the energy of sunlight energises an electron in the chlorophyll pigment, which allows the electron to move along an electron-transport-chain in the thylakoid membrane. This is analogous to the electron-transport-chain found in mitochondria. During the chloroplast’s electron transport, H+ is pumped across the thylakoid membrane producing a proton gradient which drives the synthesis of ATP, which in turn fuels the subsequent conversion of carbon dioxide into carbohydrate. An effective method of making ATP is thought to have arisen early in evolution, and has been conserved with only small variations since then. The crucial components are ATP synthase, redox driven H+ pumps and photosystems arise. A photosystem, as used in photosynthesis, comprises two components, an antenna complex and a reaction centre. The antenna system funnels electron energy into the reaction centre. These multiprotein photosystems catalyze the conversion of light energy captured by excited chlorophyl molecules. A photosystem has two closely linked components, an antenna system with pigment molecules that capture light energy and a reaction centre. The antennae system feed energy to the reaction centre. The antenna which captures the sunlight comprises a number of membrane protein complexes, called light-harvesting complexes. The reaction centre consists of a complex of proteins and chlorophyl molecules which convert the light energy into chemical energy. CONCLUSION: Since 2007 research has shown that quantum coherence is functional in increasing the efficiency of energy transfer in photosynthetic systems, including multicellular plants at room temperature. What has never been emphasised in discussions about this type of research is that similar systems to those utilising quantum coherence in plants are also present, in the form of mitochondria, in animal cells including neurons. Evolution has a tendency to retain features, so there is no reason to believe that it would not have retained the ability to utilise quantum coherence in animal cells, and thus in neurons. The intensive activity and integration involved in conscious processing thus looks a prime candidate for the more efficient energy transfer offered by quantum coherence.